Fire • Officials work to determine blaze's cause. 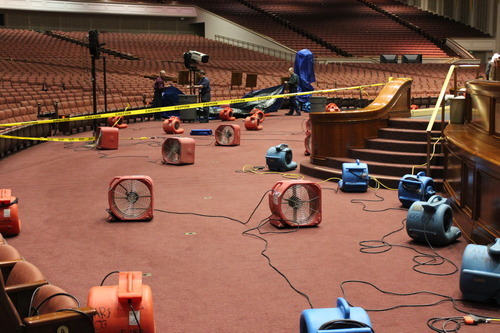 LDS Church courtesy photo Fans dry carpet in the Conference Center after water from sprinkler heads overflowed to the auditorium floor. Flooding was limited to a 50-foot area in front of the podium but did not cause significant damage. 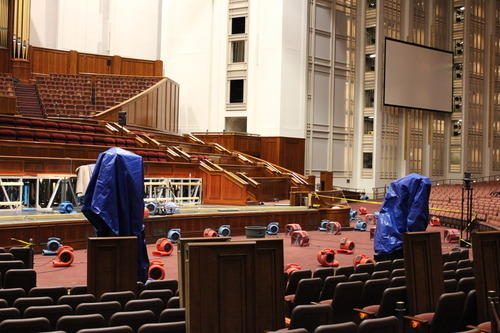 LDS Church courtesy photo Fans dry carpet in the Conference Center after water from sprinkler heads overflowed to the auditorium floor. Flooding was limited to a 50-foot area in front of the podium but did not cause significant damage. LDS Church courtesy photo Fans dry carpet in the Conference Center after water from sprinkler heads overflowed to the auditorium floor. Flooding was limited to a 50-foot area in front of the podium but did not cause significant damage. 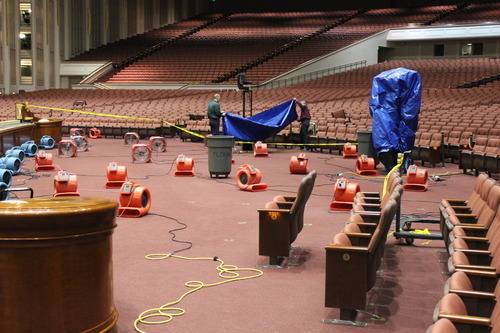 LDS Church courtesy photo Fans dry carpet in the Conference Center after water from sprinkler heads overflowed to the auditorium floor. Flooding was limited to a 50-foot area in front of the podium but did not cause significant damage. An electrical room was singed. Carpet and chairs in the main auditorium were soaked. But the wooden pulpit crafted from an LDS prophet's backyard tree was spared. Such was the damage as crews began cleaning up Tuesday after a two-alarm fire at the LDS Conference Center in downtown Salt Lake City this week. Authorities said the blaze broke out Monday about 8:15 p.m. in a mechanical room near a bank of batteries that backs up the mammoth center's electrical system when the power goes out. Fire spokesman Jasen Asay said Tuesday that investigators were still trying to determine the cause. The fire began almost directly above where the pulpit sits and was contained to the electrical room, Asay said. Two ceiling sprinklers quickly doused the flames but also dumped thousands of gallons of water into the center when they proved difficult to shut off. Authorities said more than a "couple of feet" of water fell before the sprinklers could be deactivated. Asay said the Fire Department was deferring to the LDS Church to release the amount of damage caused by the blaze. LDS Church spokesman Scott Trotter said the blaze was limited to the backup power supply cabinet, noting that the sprinklers functioned as designed and extinguished the fire. "Water overflow to the auditorium floor below was limited to a 50-foot area in front of the podium but did not cause significant damage," Trotter said in a news release. "Water in the affected area has been extracted and fans are being used to dry the carpet and chairs." 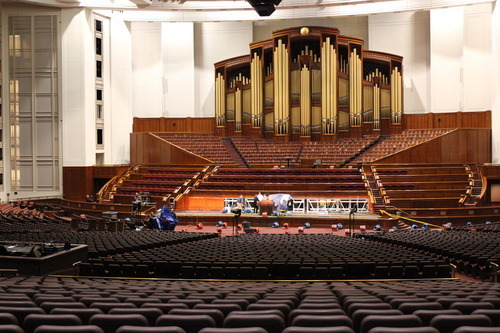 The Conference Center's pulpit, which went undamaged, was crafted from a dead walnut tree planted by the late LDS Church President Gordon B. Hinckley. "It is an emotional thing for me," Hinckley said in the April 2000 General Conference debut of the 21,000-seat center. "I have planted another black walnut or two. I will be long gone before they mature. When that day comes and this beautiful pulpit has grown old, perhaps one of them will do to make a replacement."